In an effort to improve the 8-Bit fuzz (and possibly make it Bass guitar friendly) I started working on this prototype. The knobs are as follow: thickness selector, gain, input bias, – cut, + cut, feedback recovery, volume, and a focus switch. Expect to see add-on options for the 8-Bit Fuzz in the future. Controls to adjust the amount of glitch (sonic stability control) and to increase the sustain should be available soon. This entry was posted in Custom Shop, Favorites, Prototype and tagged Ultra 8-Bit Fuzz. Bookmark the permalink. I love the bass bit fuzz. Color me interested in one with more control!!! how far along with this are you now? like…how soon to the final version? 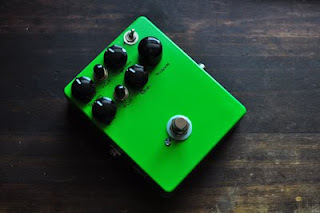 A copy of this pedal can be custom ordered at any time, but otherwise we took the most useful controls and added them to the Deluxe model of the 8-Bit fuzz which is now available on the fxdoctor.com website.